I’m often guilty of not promoting the good stuff I’m involved in, partly because I’m not good at self promotion and partly because like the car mechanic who doesn’t look after their own car, I’m a comms person who fails to communicate about the things I’m heavily involved with. So to rectify this I’m going to tell you about a great pilot program from Cycling NSW that I am playing a small part in. Jacqui Bogue, who is a member of the Board of Cycling NSW and the Chair of the CNSW Women’s Commission approached me late last year about a pilot program of women’s bunch rides run by Sydney cycling clubs. She was approaching all clubs to ask them to be involved and I readily agreed. I’m a member of Lidcombe-Auburn Cycling Club (LACC) and the team coordinator of our women’s squad, and while I don’t do much racing I work behind the scenes, and I’m really keen to get inexperienced female cyclists involved. So we’ve started a weekly bunch ride just for women. It’s an easy-paced spin around Sydney Olympic Park and if you want more details see the Cycling NSW site. As well as my club Dulwich Hill Bicycle Club (DHBC), Eastern Suburbs Cycle Club (ESCC), Southern Cross Cycle Club (SXCC), Manly Warringah Cycle Club (MWCC), Sutherland Shire Cycle Club (SSCC), Sydney Cycle Club (SCC) and Northern Sydney CC (NSCC) are all participating in some way. Details are on the Cycling NSW website. In the next few weeks they aim to have the facility to register for any of the rides via the website so keep a look out. 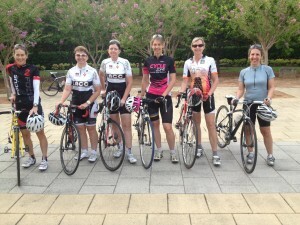 Our first ride was held last week with seven participants. Well done Cycling NSW, a great initiative. I live in Canberra and am really keen to get into Mountain Biking, recreationally at this stage – I really want to conquer my fear and have fun. Do you know how to connect with any women’s groups clubs in the ACT?